The PC is dead. Why no angry nerds? :: The Future of the Internet — And How to Stop It – Carpet Bomberz Inc.
Famously proprietary Microsoft never dared to extract a tax on every piece of software written by others for Windows—perhaps because, in the absence of consistent Internet access in the 1990s through which to manage purchases and licenses, there’d be no realistic way to make it happen. via The PC is dead. Why no angry nerds? 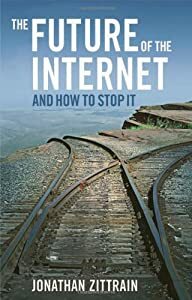 :: The Future of the Internet — And How to Stop It. While true that Microsoft didn’t tax Software Developers who sold product running on the Windows OS, a kind of a tax levy did exist for hardware manufacturers creating desktop pc’s with Intel chips inside. But message received I get the bigger point, cul-de-sacs don’t make good computers. They do however make good appliances. But as the author Jonathan Zittrain points out we are becoming less aware of the distinction between a computer and an applicance, and have lowered our expectation accordingly. In fact this points to the bigger trend of not just computers becoming silos of information/entertainment consumption no, not by a long shot. This trend was preceded by the wild popularity of MySpace, followed quickly by Facebook and now Twitter. All platforms as described by their owners with some amount of API publishing and hooks allowed to let in 3rd party developers (like game maker Zynga). But so what if I can play Scrabble or Farmville with my ‘friends’ on a social networking ‘platform’? Am I still getting access to the Internet? Probably not, as you are most likely reading what ever filters into or out of the central all-encompassing data store of the Social Networking Platform. Like the old World Maps in the days before Columbus, there be Dragons and the world ends HERE even though platform owners might say otherwise. It is an Intranet pure and simple, a gated community that forces unique identities on all participants. Worse yet it is a big brother-like panopticon where each step and every little movement monitored and tallied. You take quizzes, you like, you share, all these things are collection points, check points to get more data about you. And that is the TAX levied on anyone who voluntarily participates in a social networking platform. So long live the Internet, even though it’s frontier, wild-catting days are nearly over. There will be books and movies like How the Cyberspace was Won, and the pioneers will all be noted and revered. We’ll remember when we could go anywhere we wanted and do lots of things we never dreamed. But those days are slipping as new laws get passed under very suspicious pretenses all in the name of Commerce. As for me I much prefer Freedom over Commerce, and you can log that in your stupid little database.